Kids of all ages can participate in household chores. It can be fun and a great learning experience for kids to start chores at a young age. 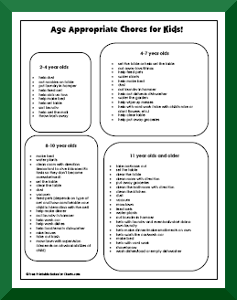 This chore list is a rough guideline of age appropriate chores for kids. Keep in mind that kids are different both developmentally and physically. Some children may be able to handle more than others, some less. You need to decide what chores are appropriate for your kids. It's a good idea to start small and add chores based on your child's readiness. It's even o.k. to start with one chore, especially if assigning chores is new in your family. We want our kids to succeed so we need to set up a system that supports success! If you'd like a postable, here is a printable chore list. You can also find a printable chore list on our page of Postems! And don't for get to check out our Chore Charts for younger kids and older kids! "Help" is the important word at this age. Many of the chores will be done as a helper and slowly kids can graduate to doing them independently!